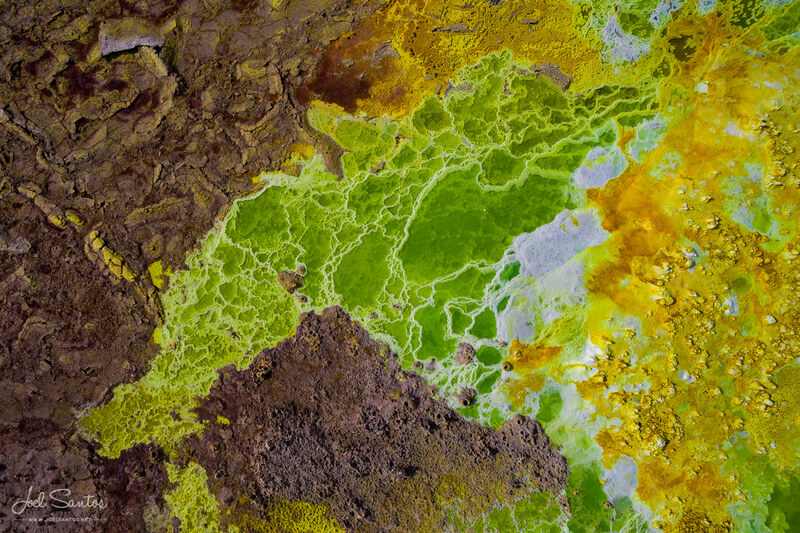 Deep in the badlands of the Afar Depression in Ethiopia is the volcano of Erta Ale, a name which in the local Afar language means “smoking mountain”. One of only 6 volcanos in the world to host a permanent lava lake, it is also known around the world the gateway to hell. Little is known of Erta Ale, surrounded as it is by thousands of miles of some of the most inhospitable terrain on the planet. Its local population, the Afar, once had an incredible reputation for viciousness towards outsiders, leading to a reputation as a place only the bravest will set eyes on. One such brave soul is Joel Santos of Portugal, a multi-talented professional photographer specializing in landscape, portrait, daily living and recently drone photography. Outside of his own shoots, he is a photography teacher, photography tour leader, writer and journalist. He is an extremely accomplished photographer who today is represented by major image banks, has had his work featured by the world’s top brands, in print media and on TV and he has written a number of photography books. After visiting Erta Ale in 2015 without a drone, he was drawn to return. His chance came in 2016 and he embarked for the isolated volcano once again, this time carrying a Phantom 3 Professional with him all the way. “Bringing the drone with me was, for the very first time, even more important than bringing my camera, since I wanted to film and photograph from a never before seen perspective and with a very specific light,” he said of the Phantom 3. Flying in an environment as dangerous as a volcano requires special care and a huge amount of skill. This is especially true when shooting aerial photography or drone video. The extremely high temperatures at this altitude would easily have melted the Phantom, and powerful thermal waves that buffeted the Phantom as it flew. “I had to avoid at all costs both flying low and directly above the lava lake,” he said. By making sure he watched the aircraft fly and did not rely purely on the live feed, he was able to make sure that his Phantom was undamaged despite the difficult environment. Each shoot taken at Erta Ale was the result of careful calculations. The low light meant that to get his shot, at least ½ second exposures were needed, but the buffeting wind meant many shots were unusable. This forced him to have to constantly decide whether to re-try the shot hoping for a calm moment or increase the ISO to capture the shot faster. With only 4 batteries available and no opportunities to charge, he had to be extremely careful with every decision he made. 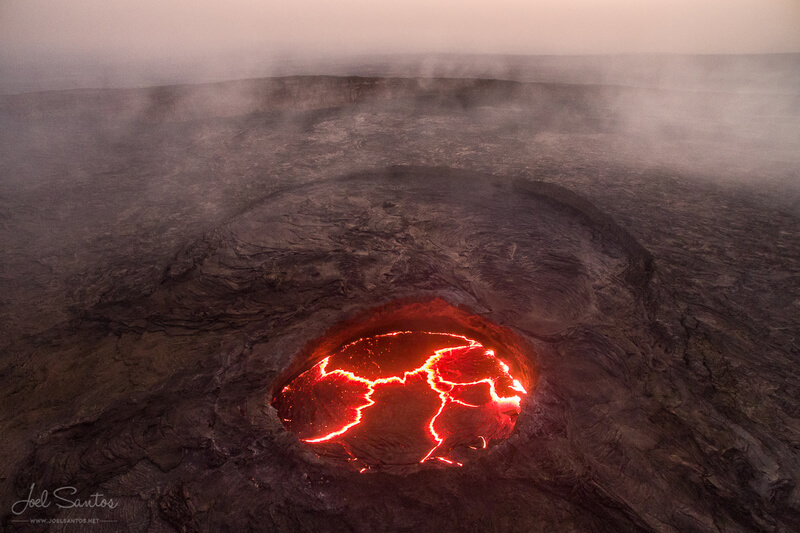 These images from Erta Ale would not have been possible without the right aircraft, and what finally triggered the purchase of a DJI Phantom 3 was its ability to connect to a smartphone. 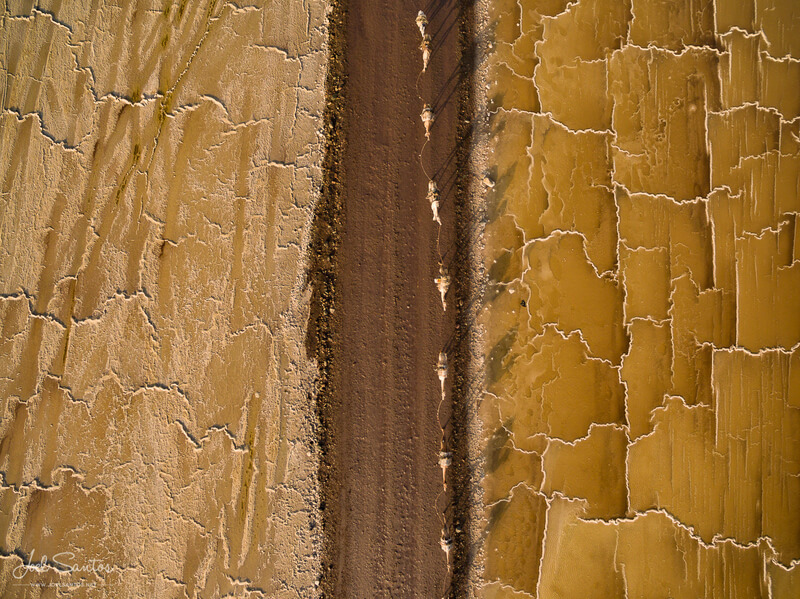 “As soon as the Phantom 3 Pro was launched, allowing me to use a smartphone as a screen and HUD display, a drone became something that I could carry easily and I immediately decided to start travelling with the Phantom 3 Professional,” says Santos. Today, he has upgraded to the Phantom 4 which has become his go-to drone camera. Drone photography and video have become such an integral part of his work that he intends to bring one on every assignment, project and photo tour throughout 2016 and beyond. For budding aerial photographers looking to push their own drones to the limits, he just has a few pieces of advice: “Fly safely, never put people in danger and keep in mind that your actions always have some effect on others - always strive for positive effects. Practice a lot and only when confident, take off to create beautiful images and amazing new stories, so others can be inspired, since compelling imagery is a powerful imagination’s fuel."